A small group of Jiaqing moulded porcelain bottles made at the Imperial kilns bear what appears to be a private studio name, despite the fact that their subject matter, colouring, and quality are identical to reign-marked examples for the court. A similar phenomenon occurs during the Daoguang period, when almost identical enamelled porcelain bottles can bear either the Daoguang reign mark or the studio name Yongle tang. In both cases, the likely answer is that the studio name belonged to a member of the Imperial family and that specific bottles made at the Imperial kilns at Jingdezhen were ordered bearing that name, perhaps as a gift from the emperor. We have now identified that person as a grandson of the Kangxi emperor named Yonglang (1756 – 1799). He had the title Prince Yigong, and he was actively memorializing the throne on economic matters in the 1790s. He is identified as the Nezhai Man of the Way who put up the money for a poetry collection (Fu, Chi, and Bian 2002, p. 202), and there is a 1793 book by a Nezhai Man of the Way on drinking games—published by the Yi Household (Yi as in the princely lineage to which Yonglang belonged). Nezhai, by the way, may be translated ‘Studio of Reticence’ or ‘Studio of Hesitant Speech’. The mingbei part of the mark retains its mystery. In other uses we have seen of the phrase, it refers to rules and regulations being ‘clear and complete’. In the present context, it must mean something like ‘approved and ready for use’, but we are still looking for corroboration. 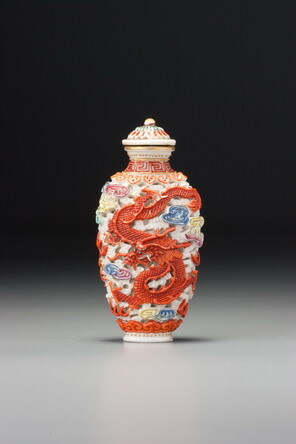 The bottle was undoubtedly made at the same kilns as those with Imperial marks. The design, enamels, glaze and quality of workmanship are all identical. The dating of this mould is confirmed by many other examples with Jiaqing reign marks. See, for instance, Au Hang 1993, no. 299, which appears to be from the same mould but with a different colour scheme and rare dark-grey ground. Another, also apparently from the same mould, is in Silver 1987,no. 58. Another bottle marked Nezhai Mingbei but a dark, sapphire-blue monochrome, also identical to many Imperial examples, was in Christie’s, Hong Kong, 1 October 1991, lot 1153. 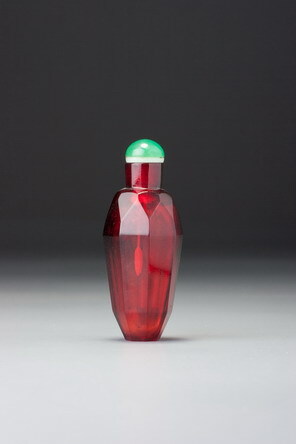 This one is virtually unworn and presents itself complete with its original stopper.